"Thank you to all the women and men who support feminism." 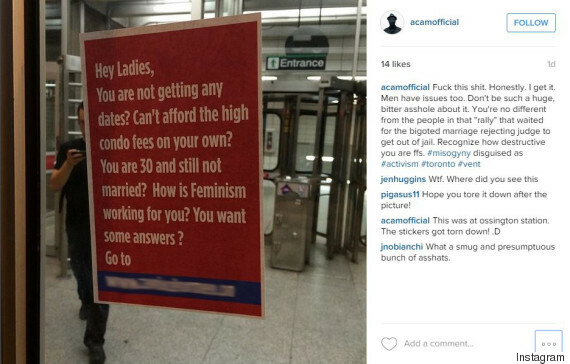 After an anti-feminist ad was posted at a Toronto subway station last week, residents are responding with their own posters. 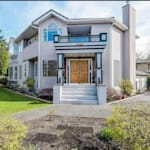 The original image, which was made by A Voice For Men, made assumptions about everything from unmarried women who were 30, and women who didn't pay their own condo fees. It also ended with the question, "How is feminism working for you?" As of Tuesday, we've now seen at least two responses, both put up at Toronto's Ossington station — where the anti-feminist ad was first seen. Posted on Instagram by user space_marked_feminist, a new yellow poster dared to ask women the same question, "How is feminism working for you?" "This made my day. I walked into the Delaware entrance at Ossington station and was greeted by this beautiful response to the anti-feminist "ad"/piece of garbage that was displayed a few days ago. Whoever put this here I want to thank you! And thanks for leaving a cup of pens so people can write their awesome answers to your question!," user space_marked_feminist wrote on the social media site. Another smaller poster, this time an orange one, was also seen at the west-end subway station with several responses to the original post. Some of them included,"How is feminism working out for me? Just great, actually. Thanks to feminism, I can get an education, have a job and support myself financially and rent or own property," the image stated. "Every day I am grateful for the freedom and opportunity I have as a result of the feminist movement. Thank you to all the women and men who support feminism." The original ad, which was first spotted and posted on Instagram by user Andrew Cameron, has now received plenty of back-and-forth between men's rights movement supporters and Cameron, who continues to defend his stance. "You call that a dissenting opinion? That's hate speech. The organization that posted that encourages violence against women. Go read about it and go find the men's groups that are fighting for awareness with respect and morality," he wrote to one supporter. "How is feminism working for me? Well, I'm wearing pants, taking the go train to work, and I'll be voting in the next election. "Works just fine for me. By the way feminists are not anti men. They are pro women. Most feminists i know quite like the male people in their lives. So, stop using claptrap like this to brand women and make them fearful of owning up to what they want, should have and are. To me, women who do this owning up are by definition, feminists."